Tags: community, Education, guest blogger, Inspiration, Motivation, Outreach, Randy. I consider myself extremely lucky to have been a part of 2020 Vision Quest since its inception when Randy asked me over for lunch to pick my brain about an idea. From day one, I loved the concept and goals and hold immense admiration for Randy’s courage and drive. The most awesome part of what he does, in my not-so-humble opinion, is his school outreach. I have been there when Randy has spoken to the elementary classes that my own children were in and left each time inspired and feeling better about the world we live in. 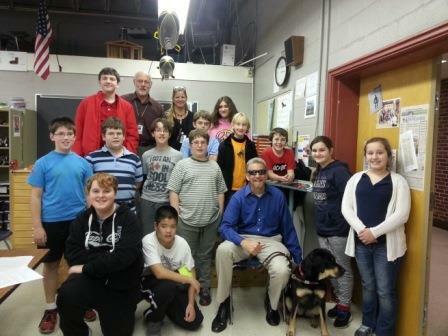 Randy, Autumn and the 2014 Elm Street Eyrie FLL Team. Now a little about FLL – it’s not just about the LEGO® robots. As part of these competitions, the teams must also present a project around the theme of the year and work within the core values of FLL – teamwork, cooperation, discovery, mentorship and fun. This time around they needed to address how to assist in learning. It’s a pretty broad category and the kids decided that they wanted to figure out how to help someone who is visually impaired. Randy was a tremendous resource to the kids as he told them the facts of his background and shared with them all of the different ways he learns about the world around him from directions, his environment, the weather, communication tools, computers and everything else. 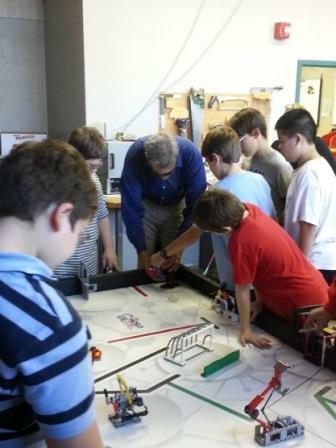 Team Eyrie demonstrates the FLL Obstacle Course table to Randy. The kids were attentive and absorbed a lot. They even got to show Randy the obstacle course table that they used to program the LEGO® robot. As they spoke with Randy, I noticed a change in how they communicated. At first they all spoke at once and their enthusiasm was overwhelming. But then they settled and learned how to communicate in a way that was detailed, thoughtful, and expressive. In the age of “LOL,” “OMG,” and “BRB” this is not as easy as you would think. Just like the robots, these kids were programming their brains and were themselves learning. As I sat there listening, two themes resonated. First: Communication is key. Whether it’s explaining where a door is or expressing your point of view – the world stops without key human communication. And I am not talking about Facebook posts, Tweets, texting, or even this blog. Honest-to-goodness human interaction with your voice – words and tone – opens doors to so much for so many. Second: Don’t be afraid. Be brave. Take chances. It’s harder than it sounds, but if we all try to do #1 to our best ability, there is no fear. Such simple concepts that we all, young and old alike, should keep closer in our playbooks of life. Oh what we could be and what we could give to the world if every day we woke up and took on each day with an open mind, brave heart and emotive spirit. Am I making more of it than it is? Sure. Maybe. I am known to dig a little deeper than necessary at times. But I also know that at the end of the session one of those young men came up to Randy and thanked him because before Randy spoke with them and told them his tale he was afraid around the blind. Now he knew he did not have to be and just needed to communicate in a new way. You’re likely asking yourself, “So how did the kids do? Did they win?” The kids went to their first competition on November 22nd. They did a tremendous job all around. Their project focused on the creation of a new app for the visually impaired to lend assistance crossing roads and intersections. 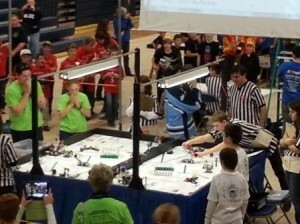 And in addition, their robot came in 4th out of 16 teams in the Robot Obstacle Course Tournament! (I almost started the wave in the stands – it was so exciting!). In the end, Team Elm Street Eyrie did not place overall and are not moving onto the States competition but this team pulled together in short order and delivered something that they should be very proud of. They worked as a team, communicated their goals, contributed their best and took some chances. That’s a check in the “win” column no matter what.